5 days remain until football. Are you ready for game day? Posted on August 27, 2018 at 8:30 am. The 2018 FIU Football season kicks off this Saturday, Sept. 1, when our Panthers take on the Big 10 Indiana Hoosiers! And it’s shaping up to be an exciting season. 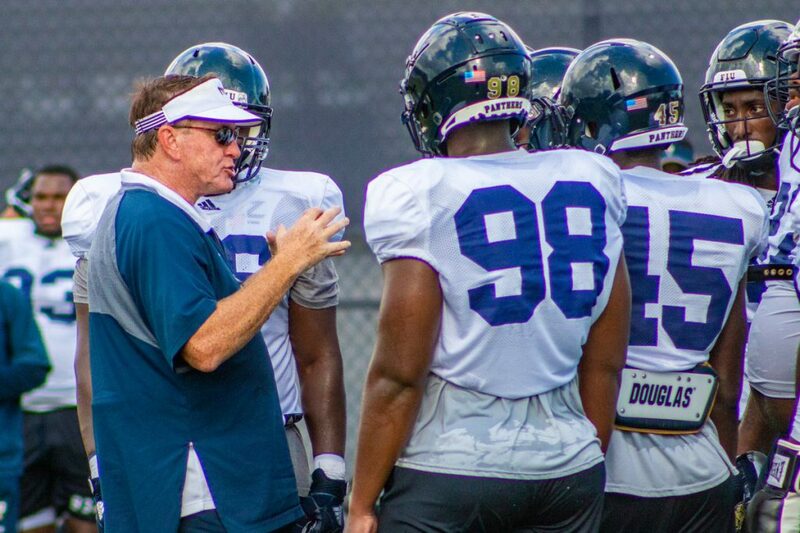 The Panthers are coming off an eight-win 2017 season that sent them to FIU’s first bowl game in six years: The Bad Boy Mowers Gasparilla Bowl in St. Petersburg, Florida. And a slew of new game-day attractions are sure to make for a new and exciting fan experience. The team is counting on your support this fall in their pursuit of another bowl appearance. Don’t miss the chance to join fellow alumni and roar for our FIU Panthers! The FIU Alumni Association will host a series of Alumni Pregame Experiences, including the return of Roar Lounge for the season opener. Cool off with fellow alumni, family and friends in the A/C at Panther Hall, just a few steps from the stadium. There will be drinks, food and fun for the whole family – and everyone is welcome, not just alumni! The Alumni Pregame Experiences will begin 2.5 hours before each home game. Admission starts at $10 for adults and $5 for children. Additionally, a pregame season pass is available for $65 (a 35% discount! ), which gains you access to the Alumni Pregame Experience all season long. Click here to pre-register. Enjoy a new in-stadium experience during the game, including completely revamped concessions and an Everglades-themed lounge in the north concourse. Click here to purchase game tickets and season passes. The university has instituted a clear-bag policy within the stadium. Each ticket holder, including children, will be allowed one clear plastic bag that does not exceed 12″x6″x12″ and one small purse or clutch that does not exceed 6.5″x4.5″. Clear hear for more details. You can find air-conditioned restrooms in Lots 5 and 6. Food trucks will be located by the Herbert and Nicole Wertheim Performing Arts Center between student tailgating in Lots 4 and 5 and Faculty/Staff/Alumni tailgating in Lot 6. 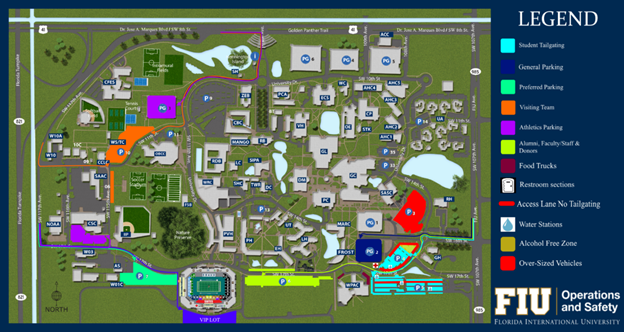 Tailgating and parking updates are noted in this map from FIU Parking & Transportation.